The three years leading up to Walter Rodney’s assassination on June 13, 1980, were dangerous times in Guyana. Living with State surveillance, the Police Death Squad, thugs of the House of Israel Sect, and economic hardships had become our new reality. Informers were everywhere. A treacherous remark could cost you your job or worse. During session three of the Walter Rodney Commission of Inquiry, Allan Robert Gates was the star witness. Since January 2014, he has been serving a two-year prison sentence for fraudulent activities. He claimed they were “trumped-up charges” to prevent him from testifying. Gates described himself as a security expert. As a young man in June 1977, he joined the Police Force. Two years later, he was assigned to the Special Squad of the Criminal Investigation Department (CID). In July 1979, fate changed the life of Robert Gates. That month, Walter Rodney and other members of the Working People’s Alliance (WPA) were arrested as perpetrators of the fire that destroyed the building housing the Ministry of National Development and Secretariat of the ruling political party. 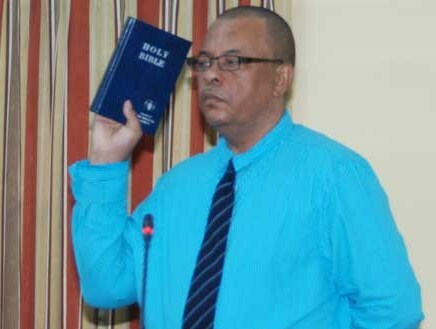 Assigned to guard one of the arsonists brought to CID, Gates came face to face with Rupert Roopnaraine, a Professor at the University of Guyana and co-founder of the WPA. On learning that his charge needed a bodyguard, he seized the job opportunity. When Gates submitted his resignation to the Police Force, he received a “lucrative offer” from the Crime Chief that he could not refuse: a pay increase equivalent to that of a Police Superintendent. All he had to do was take note of Dr. Roopnaraine’s movements and the people he spoke to, and survey the activities of the WPA. He became a police undercover agent. The Death Squad’s opportunity to eliminate Dr. Roopnaraine came when he expressed interest in obtaining a G3 submachine gun. Gates’ handlers over packed the ammunition to explode in the shooter’s face. But Gates could not execute the plan. “Dr. Roopnaraine was a good man,” he told the Commission. Technical training in the use of eavesdropping devices, planted in Dr. Roopnaraine’s car and the WPA office, and explosive electronics came from a former, Russian KGB agent contracted by the government. Gates did not train alone. He trained with a comrade from his village, Army Sergeant William Gregory Smith. As the army’s undercover agent, Smith’s job was to take down Walter Rodney. Smith supplied Dr. Rodney with the explosive-rigged walkie-talkie that caused his death. Implicated in Dr. Rodney’s assassination are former high-ranking police and army officials. Records of service and undercover activities for both Robert Gates and Gregory Smith have disappeared. Gates is left out in the cold. It’s easy to condemn Robert Gates for complicity with his corrupt superiors. The young Gates, most likely of humble origins, allowed money and power to cloud his moral judgment. Such behavior continues to plague humankind, even at the highest levels of government and among prominent citizens. Our choices in life have consequences. Sometimes, they change the course of a nation. If I haven’t already mentioned it to you, Rosaliene, you might enjoy “The Lives of Others,” a German language (subtitled) film about a Stasi agent in former Communist East Germany who is, like Gates, put in a difficult position of surveillance with very unexpected consequences for him and the viewer. An absolutely great movie. Thanks for the movie reference, Dr. Stein. I’ll check it out. A big thank you, Cyril. Have a sunshine week! Who done it is not as important as why ? Am sure Burnham was aware of this and turned a blind eye. He was complicit of the actions of his Gestapo. Why would a brilliant scholar become a tyrant.? power over ‘life death’s….et tu Burnham. Wish them the best results. Kamtan, in my view, the ‘who’ explains the ‘why.’ You can’t have one without the other. It was tragic for Guyana that its brilliant black scholar, Forbes Burnham, became a tyrant. Also tragic is that his autocratic government eliminated another brilliant black scholar. Perhaps Walter Rodney was much more than a political opponent to Forbes Burnham. How I wish that a historian would take on the challenge of writing a biography of Forbes Burnham! Maybe one of his two surviving daughters will…. It would certainly be a ‘must read’ best seller by all guyanese. While their work would be a ‘must read,’ I doubt they would be able to write an unbiased biography. of how such a brilliant mind becomes a tyrant. N.Augustus, thanks for sharing your thoughts on this matter. I like your idea of blacks transforming the PPP for within. It would return to its original multiracial composition when founded in 1950.
but as the saying goes…. If you cant beat them join them.!! with so many new younger voters….if they vote.!! And of course there is the ‘uncertainty’ of the overseas vote. The bigger the turn out the lesser the chance of change. PPP certainly are favourites now….but too early to speculate. Kamtan, would that also apply to Guyanese in the diaspora who have family and investments in Guyana? Always a pleasure disagreeing with you….my fatal attraction !